MS. Finally, a new retail façade in London of real interest! Far from the ubiquitous full height glazing we have come to expect, this façade is characterful and respects the heritage of London’s commercial architecture. The choice of cast-iron is novel but entirely appropriate – it is omnipresent on the London Street, in its railings, gratings, bollards and lampposts. The complex interlocking circles of the patterned iron façade recall the form of London’s familiar Regency railings – it makes me want to get my old spirograph out! As you approach on the pavement the depth of the pattern is revealed and the whole shop-front appears to be woven. The façade curves inwards to create a recessed entrance with an iron canopy and step. This stepped threshold is becoming polished with use and adds a further layer of interest to the natural patination of the cast iron. Eye-catching vitrines in curved glass – a clear reference to the nearby arcades -punctuate the dark façade and bring a carefully curated display to the passerby. The form of the original Georgian building has been retained, and the existing windows above inform the size and placement of the new openings. Above the new façade the existing brickwork and sash windows has been painted matt graphite, which compliments the dark tones of the cast iron. 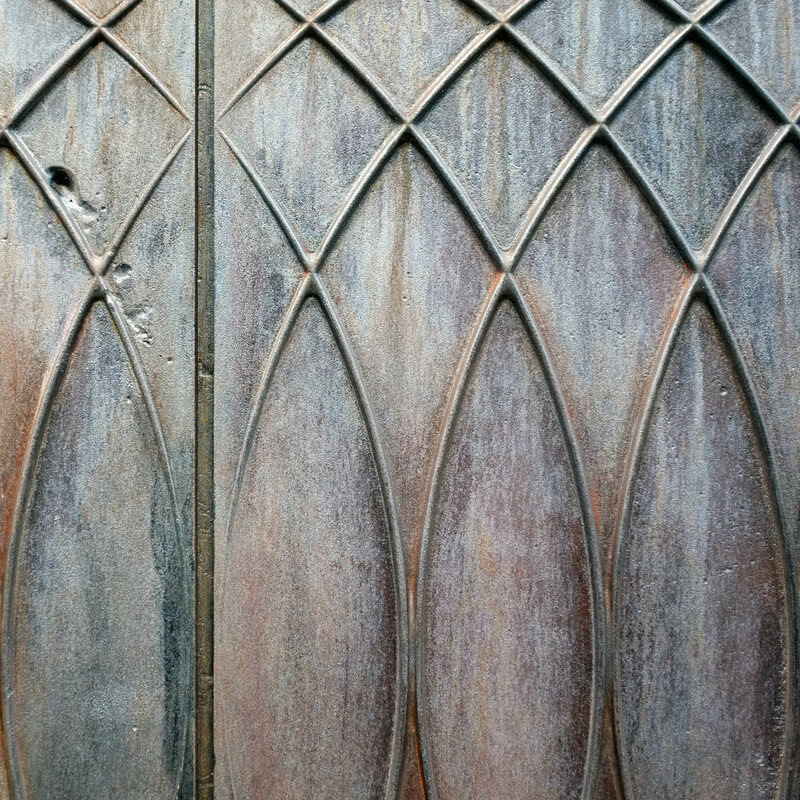 A secret door – presumably for goods access – in stained oak, is carved to match the patterned iron panels. Marks left by the craftsmen who cast the iron add further movement, and bring a sense of solidity and permanence to the intervention.